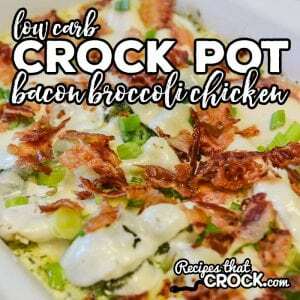 Crock Pot Bacon Broccoli Chicken (Low Carb) - Recipes That Crock! Do you love bacon? Our Crock Pot Bacon Broccoli Chicken Recipe is one of our favorite ways to cook up chicken and if you are eating low carb, this dish only has 2.4 Net Carbs per serving! Cris here. We have been on a broccoli kick around here ever since we made the Crock Pot Chicken Divan the other day. So today I tested out my new Crock Pot Bacon Broccoli Chicken Recipe on the family and they give it two big thumbs up! Cheese, bacon and green onions pack a powerful flavor atop the chicken and broccoli. And, the amazing cream cheese butter sauce is incredible! 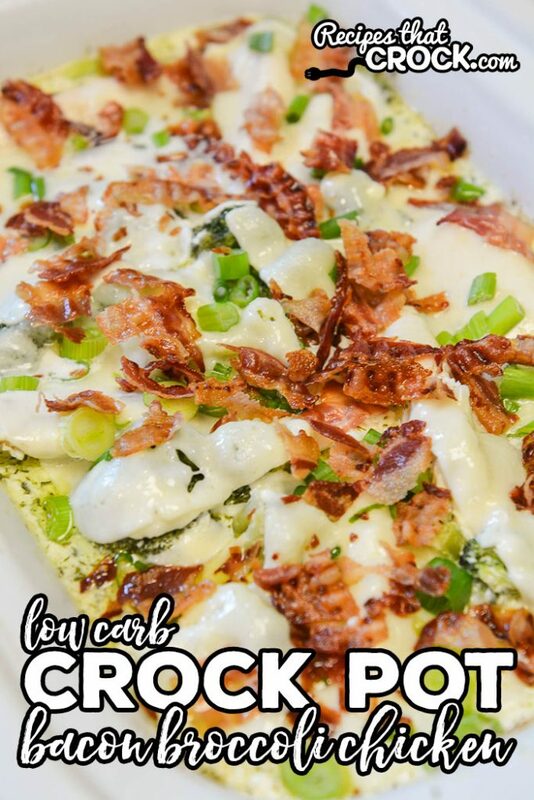 This is one of those low carb crock pot dishes that all of our family and friends LOVE. No one ever even thinks about it being low carb ;). We used our casserole crock to make this yummy dish. We love how it evenly cooks the tenders and makes dividing into portions a snap! If you desire a smoother sauce, whip cream cheese with dip mix in a mixer. Then slather on top instead of step 2 and 3. I prefer the convenience of not getting mixer out and find that mixing at the end is good enough for me. Place tenders and broccoli (frozen) in bottom of a casserole crock or 6 quart slow cooker. Season with dip mix and sprinkle with butter cubes. Cover and cook on low for 3-4 hours or until the tenders are cooked through. Place cheese slices evenly over top of chicken and broccoli, overlapping if needed. Sprinkle with bacon and onions. I’m eatiIng Low carb and trying to make dinners that EVERYONE kids and husband will eat and I can just make biscuits and know everyone is happy. this is a perfect example. and it was delicious! AND the fact that my hubby who doesn’t like ranch OR cream cheese actually complemented this is a HUGE low carb win for me! We love to hear that! So glad everyone enjoyed it! Hi.. made this recipe this past weekend. Loved the creamy yet tangy taste. This is for sure a nice recipe and is an easy jump off point for more variations. I immediately thought mushrooms and jalapenos to kick it up a little. looking forward to making this recipe again. So glad you enjoyed it. I would love to hear how your variations turn out. Enjoy!! Could you just use fresh broccoli? I have very little room to store anything frozen. I live in a caravan which has a very tiny freezer..
You could use fresh, it may just take a little longer to get tender. what would be good to serve this with? side dishes? We eat it as a one pot meal, however, you could serve it over rice or riced cauliflower if you are watching carbs. We don’t usually buy Havarti cheese. Would Mozzarella be OK? We chose Havarti because of how creamy it is when it melts, but you could try mozzarella if you would prefer that instead. Enjoy! Love all your dishes! I have been using whipped cream cheese in the tub when a recipe calls for block cream cheese as it melt better & no need to use beater or stir. We will have to try that! Thanks for the tip! Hi Donnie- We chose Havarti because of how creamy it is when it melts, but you could try mozzarella if you would prefer that instead. Enjoy!